Shelf stable foods are those that can be safely stored at room temperature, or “on the shelf”. These relatively non-perishable products include canned and bottled foods, dry fruits, nuts, pasta, and nutritional foods etc. These foods are made shelf stable by treating them with heat or dried to destroy foodborne micro-organisms that can cause illness or spoil food. Besides the process treatment, packaging plays a vital role in food preservation. Today, plastic packaging formats are quickly replacing cans and jars as the preferred format for ready to eat foods. At Ester, we manufacture and provide a wide range of polyester films and specialty polymers that promise excellent barrier against oxygen and external influences while ensuring transparency. From baby food to shelf stable prepared meals, our packaging films have been proven commercially in a number of processes. 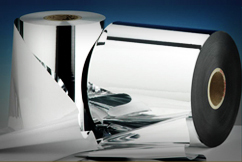 Flexible packaging solutions on offer include a variety of value added and specialty Polyester Films such as Metallized Ultra High Barrier film (which can replace aluminum foil), Transparent High Barrier film (a chlorine free solution) and other barrier films. With its extensive knowledge of specialty polymer construction, we are well known for our ability to help food processors develop optimum products for specialized Packaging Applications (Barrier enhancing polymers). We work in close cooperation with packaging machinery manufacturers, tray producers, food producers, packers and retailers to develop innovative packaging films that give us a competitive edge in the market.